The Genesis Expo Museum is the biggest Creation Museum in the UK and being located in the heart of Portsmouth, within view of the historic dockyard and HMS Warrior, it attracts tourists from all over the country. HMF had to carry out extensive steelwork and structural surveys at the Grade II Listed building. Hampshire Mezzanine Floors provided designs and steelwork layouts, which were later approved by Building Control and local structural engineers to accept the new mezzanine floor installation at groud floor level in early February 2010. This was no ordinary design as the floor columns had to be positioned carefully to sit on the basement walls below. Where there were no basement walls, Hampshire mezzanine Floors had to provide pad foundations in the perimeter walls to eliminate perimeter columns. 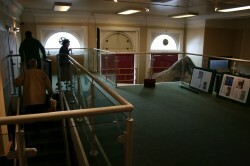 This also advantaged CSM, giving maximum space beneath the new mezzanine floor to fit additional display cabinets. Access to the mezzanine floor is by steel staircase, which was positioned at the rear of the exhibition on a natural viewing route leading visitors to the first floor. The mezzanine floor has a DDA compliant toughened glass balustrade fitted on the front and side edge, giving visitors a greater view of the museum and Boris – the giant 20ft long model of a dinosaur! Beneath the floor, HMF installed a Black suspended ceiling grid with 600 x 600 Black ceiling tiles to maintain the dark museum atmosphere, allowing the display cabinets to be more visible to visitors. 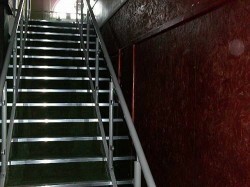 The mezzanine floor and steel staircase was finished off with new carpets. At first floor level, new track display lighting was installed, allowing flexibility to move the display lights to suit the positioning of the displays in the future. Dr David Rosevear, Chairman of Creation Science Movement said‘The CSM trustees are delighted with the mezzanine floor at our Genesis Expo on The Hard. Thank you for a great job’. The mezzanine floor installation was a huge success. It has almost doubled the area of the exposition, providing more space for additional displays and visitors into The Genesis Expo.